The pressure in Syracuse – 50,000 expectant locals in Mafioso sunglasses – had been intense, but nothing like this. In April the British contingent, its cars and drivers, had arrived in Sicily breathlessly late and tired after contesting the Aintree 200 – already the season’s sixth Formula 1 race for some – just three days prior. In contrast, you had kept your cool, made no complaints, demands or alterations; settled neatly to your new environment. After a hesitant start from the middle of the front row, you had picked them off: Graham Hill, Jack Brabham (the winner at Aintree), Innes Ireland, Joachim Bonnier, Dan Gurney and John Surtees. Clinically quickly you had the lead by the end of the sixth lap. Only Gurney’s Porsche could stay close and you had controlled that gap until crossing the finish line – and going straight on at the hairpin by way of metaphorical release after almost two hours of physical and mental effort. Victory had been gained but the element of surprise lost and so now the heat was on under a shimmering July sky in Champagne. 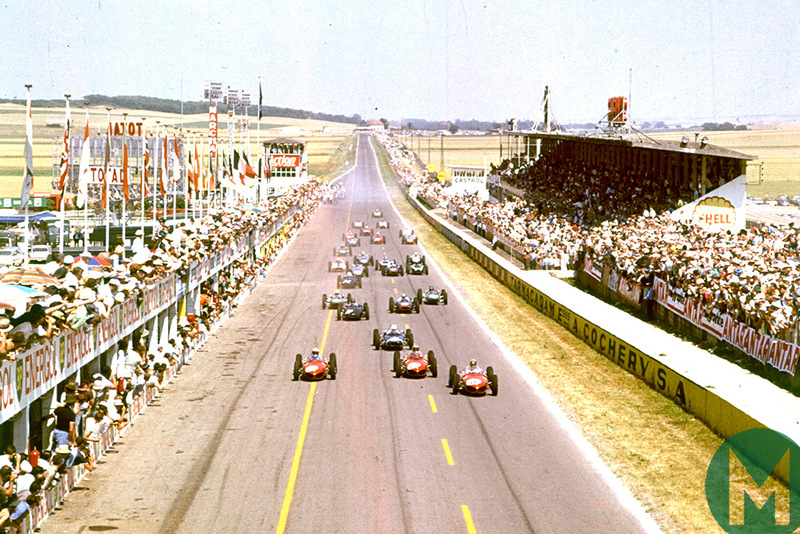 Throughout practice you were tailed by green cars seeking a tow down the long straights of the triangular Reims circuit; jostled by drivers determined to put you in your place. Your team manager saw no reason to protect you because your pace was not a threat to the three works cars that swept the front row – plus you had to learn somehow. Every session was treated like a race. And a good job, too. With Porsches left and right, Lotuses fore and aft, and vice versa, there was – literally – no room for error after the flag was dropped. Giancarlo Baghetti was an aesthetic, slightly chubby son of a wealthy Milanese. Catching the racing eye with a handful of excellent performances in a Formula Junior Dagrada-Lancia generally reckoned inferior to its Stanguellini-Fiat rival, he had been selected – after much argument – to become Italy’s Next Big Thing in 1961. A confederation of privateer teams had persuaded Enzo Ferrari – no easy task! – to provide a car, albeit one fitted with an older specification of engine. Now Baghetti was tasked with keeping it on melting French roads as Gurney and Bonnier, Ireland and Jim Clark, plus the Cooper of BruceMcLaren, roughed him up. Their slipstreaming battle for fifth was the highlight of a French Grand Prix being otherwise dominated by the ‘Sharknose’ Ferraris of Phil Hill, Wolfgang von Trips and Richie Ginther. Their 120-degree Dino V6s generated perhaps 30bhp more than the British cars’ stopgap Coventry-Climax ‘four’ for the new 1.5-litre F1 – and 10bhp more than Baghetti’s 65-degree version. The latter had been almost six seconds slower than Hill in practice and therefore found himself surrounded. The sharks were green from where he was sitting – and he was the bait. So he stuck All Arms and Elbows Ireland on the grass. 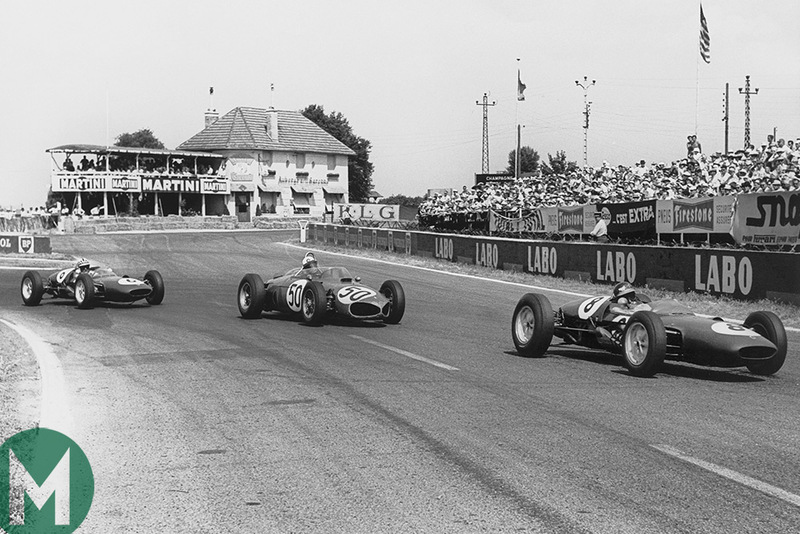 This became a battle for fourth when Stirling Moss pitted his Lotus because of brake problems. And fourth became third when von Trips stopped with water trickling from his left-hand exhaust pipe. The remarkable thing was that he was more than holding his own… giving back as good as he was getting and not making any mistakes under conditions in which a mistake would have been excusable. 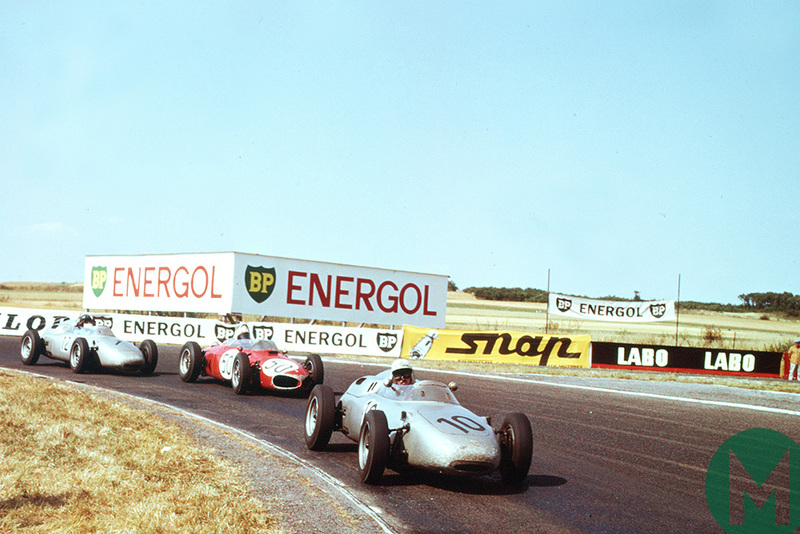 The track was breaking up and on lap 38 Phil Hill ran wide at Thillois and looped lazily, the subsequent tangle with Moss causing the Ferrari to stall. So now Ginther, who had already survived a spin and an excursion, led. Within a lap, however, he would pit to complain of plummeting oil pressure. New rules forbade a top-up and he parked at Muizon on lap 41. Jenkinson: One can hardly imagine Baghetti’s thoughts as he went by the stricken Ferrari, having already passed Phil Hill push-starting his. The whole hopes of Italy rested on his shoulders. It seemed quite impossible that such a newcomer to big-time racing could go on battling against more experienced drivers without making a mistake of a missed gearchange, an error in braking, or a misjudgment of speed into a corner, or getting elbowed out of line by his superiors. Though Ireland had dropped back because of a faltering engine and Lotus team-mate Clark had lost the tow when a stone shattered his goggles – this was racing at its most muck and bullets – the flat-four Porsches were circling still. Bonnier and Gurney now attacked with renewed vigour… the vast crowd around the circuit became alive, the pits and grandstands were in a fever and signals were unnecessary. It was a battle to the death. Bonnier succumbed in a haze of oil smoke, but team-mate Gurney, whom Ferrari had let slip through its fingers despite the American’s brilliant breakthrough 1959, was determined to reverse that Syracuse result. He out-braked Baghetti at the final corner – but there remained a long straight run to the chequered flag. 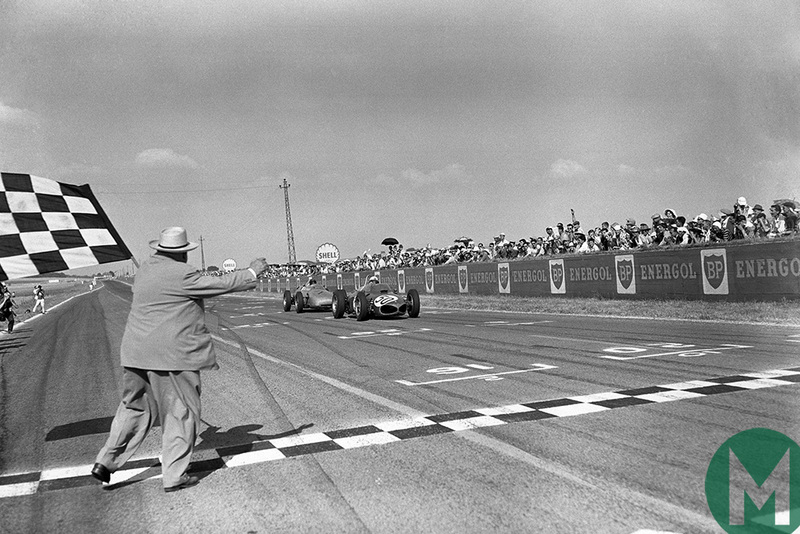 With just 300 yards of the 268 miles to go, the Ferrari jinked from Dan’s slipstream to win by a tenth: One of the most perfect pieces of timing that would have done credit to Fangio himself. Luck – and a car advantage – was involved, no doubt, but this had been no gimme. Baghetti would win again – at Vallelunga in a Porsche borrowed to secure that year’s Italian Championship; in a Fiat-Abarth ‘buzzbomb’ in the 1966 European Touring Car Championship; and in an unheralded Branca in a tragic F3 race at Monza in 1967. But he had long ago had his day of days in the sun. 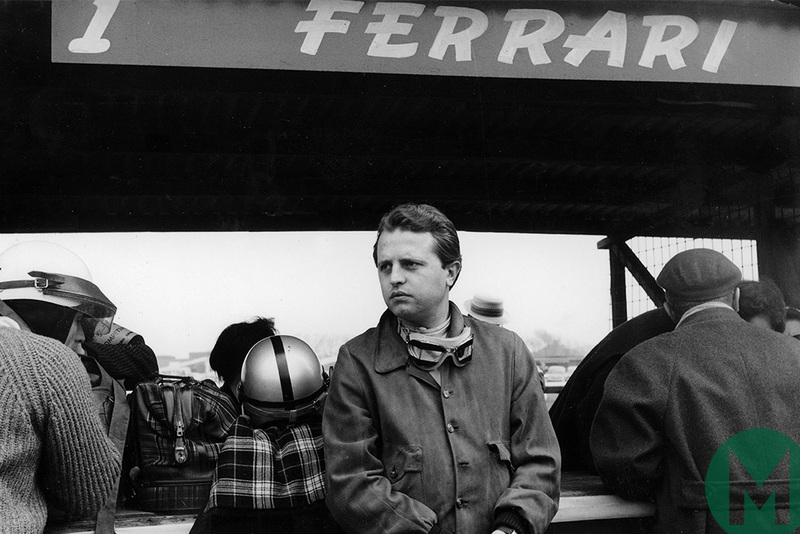 Enzo rated him – compared him with Achille Varzi indeed – but Baghetti, like fellow aesthete Hill, tired of the Scuderia’s Machiavellian default and followed the American to its ATS offshoot in 1963. His F1 career had stumbled in 1962. Now it tumbled. One-off Italian GP outings in 1966 and ’67 – in a Ferrari loaned to Reg Parnell and a third works Lotus 49 – saw him struggle in qualifying but come through in the races, a jammed throttle and a blown engine costing him probable points finishes. His works Ferrari ensnared by a multiple shunt during the Monza Lottery Formula 2 race of 1968, he decided to leave such shenanigans to younger, hungrier men. After a successful career as a motorsport and fashion photojournalist, the man who had worked that miracle at Reims died in November 1995. Born on Christmas Day 1934, he was just 60. Taken too soon. Immortality assured. Bob, thanks for the early Christmas present. will be different as I've already requested the Friday and Monday off. about modding from 2006 or thereabouts here. Should be about Laguna Seca.